If you have any information about town, school, or church histories, or old photographs of places in Bamberg County, or group photographs of churches, schools, etc, please consider making a contribution here! Let's make Bamberg County come alive! "Bamberg is named for Major William Seaborn Bamberg who came to this community in the 1840’s. His grandfather, John George Bamberg, a native of Germany, settled near River’s Bridge following the Revolutionary war. Major Seaborn Bamberg became one of the most influential businessmen in this section of the state. Through his foresight, leadership, and ingenuity, he had the town incorporated when it was no more than a country crossroad. The original charter, according to records, was dated December 19, 1855. In earlier years the settlement had been known as Lowery’s. "Five men owned, in 1852, the site of the present city, according to a deed filed that year in the Barnwell courthouse. They were G. W. Bamberg, W. S. Bamberg, I. R. Simmons, Owen R. Faust, and Howell Easterling. Major Bamberg, Dr. Raysor, and J. J. Barnes purchased a lot for $75 in 1853, and gave it to the Methodists for a church site. The lot is the present Restland Cemetery (transcribed here: Restland cemetery). Major Bamberg, who died in 1858, is buried in Restland cemetery." (Source: City of Bamberg web site). Although only a crossroads at the time, the town was chartered on December 19, 1855, and in 1860, Bamberg had about 250 residents. After the end of the Civil War, the establishment of a business community in Bamberg was due to the efforts of General Bamberg, Col. T. J. Countys, and H. J. Brabham. Later, arrived Thomas and Dr. J. B. Black, the O'Neals, Hartzogs, Johnsons, Rileys, Hayses, Hootons, Wrights, Eveses, Rices, and Crums. H. J. Brabham caused the bridges to be built across the Edisto river in 1882, at the site of the present Highway 301 bridge. In order to win the county seat, the Bamberg city fathers promised to build a courthouse, which they did with the issuance of $10,000 in bonds and the use of state penitentiary labor. It was erected in 1897. (South Carolina Postcards, Vol. II). 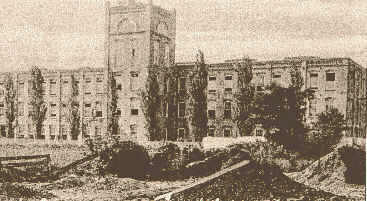 The Bamberg Cotton Mill was principal to Bamberg's well-being from 1892 to around 1969. The building was operated for the last twenty years of its existence as the Bamberg Textile Mills. It was demolished in 1997. (South Carolina Postcards, Vol. II). 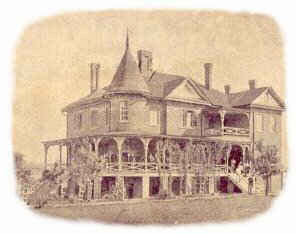 The Mayflower Inn, located at the corner of Bridge Street and North Railroad Avenue in the 1890s, was a popular stop for travelers. It was originally known as the Cope House. The Carlisle School in Bamberg, was begun in 1892 by South Carolina Methodists as a coeducational preparatory school for Wofford College. The school was named after James H. Carlisle, president of Wofford College from 1875-1902. (South Carolina Postcards, Vol. II). The public school building burned in November, 1907 and classes were held temporarily in the courthouse. The cornerstone of the new school was laid May 7, 1908, and E. P. Allen became school superintendent, serving in that capacity for 40 years. Bamberg's first fire department was organized in 1908, with W. D. Rhoad as chief. Trinity Methodist Episcopal Church South, now Trinity United Methodist, was built in 1904. The original building is still in existence. Probably the oldest community of Bamberg County, the community got its name from Major William Buford's bridge over the Salkehatchie River. The early settlers in and around the village were the Kirklands, Brabhams, McMillans, Kearses, Moyes, Dickinsons, Barkers, Hays, Ayers, Bests, Brelands, Ritters, Priesters, Grimes, Harleys, Wilsons, Knights, Rushes, And Rileys, according to the first U.S. Census of 1790.
the Methodists built their own church on land given by Robert C. Kirkland, the first Mitzpah Methodist Church. In 1856 a new building was erected, two miles west of the original location. By 1880 the community numbered 1,567 persons. The village was incorporated in 1895. Today, only the Mizpah church remains of the original business center of the community. "According to the Rev. M. M. Brabham who wrote the book “A Family Sketch, And Else Or Buford’s Bridge And Its People”. There were a number of neighborhoods near Buford’s Bridge, Bamberg County, S.C.
“Sley Town” near Graham’s Turnout (now Denmark, Bamberg Co., S.C.) The Ayer and Rush families lived near “Sley Town”. I am directly related to the Rush family. According to Rev. Brabham back in 1923, “Sley Town” was the eastern section now known as Olar, S.C. Going north and eastward from “Sley Town” you enter what was known as the Rice neighborhood. I am directly related to the Rice family. Going South, you come to the Colston Community of Bamberg County, S.C. Families in this neighborhood were the McMillan, Brabham, Kearse, Kirkland, McMillan, Beard, Varn, Clayton, Sease, Bishop and other families. In what you would call the Ehrhardt area of Bamberg County, S.C., there were the Kinards, Bishops, Copelands, Chassereau, Rentz, Ehrhardts and other families. Most all of the above mentioned names, I am either directly related to or they are my cousins or distant cousins." The following are excerpts from an article quoted in the Raysor Family History, privately published by Frank Wannamaker Raysor. Unfortunately, he doe not list the source of the article. If anyone has additional or contradictory information, please let me know. "Buford Bridge Community is located towards the eastern part of what was Barnwell County - but now Bamberg County. The Community got its name from the Bridge over the Big Salkehatchee at this point. At the point where the Bridge spans the stream, and on its northeastern side, is where the little village of Buford Bridge stood. "The founder of the Ayer family in Buford Bridge was Lewis Malone Ayer, said to have been a native of Marlboro District. He was the son of one Thomas Ayer, and was a boy in his teens during the Revolution and acted as courier for some American military officer. "His children were - Charles K. Ayer, who was a doctor, probably the first person of this profession who ever lived and practiced medicine in the community. Dr. Ayer's old residence stood on the East of the Ayer Mill Pond, some two or three miles northwest of Buford's Bridge...."
"Mr. Lewis Malone Ayer, Sr., bought out the interest of Mr. Buford and opened a store. Later, he was joined by Matthew Moye...."
"Buford Bridge was situated at the junction of two prominent roads, one coming from Barnwell about sixteen miles to the northwest and in a general way paralleling the Salkehatchee which flows southeastward, led to the lower county in that direction; while the other, coming from Orangeburg, crossed the river at Buford Bridge." Bridge, the original building dating from about 1851. The church and cemetery are located just of Hwy #301 less about a mile north of the Salkehatchie River, and many of the early families of Buford Bridge are buried here, including the families of Ayer, Brabham, Kearse, Kirkland, Neeley, Main, Milhous, Rodt, & Weekley. An article from The Post And Courier Newspaper about Mizpah Church, July 8, 2003. The name of the community of Colston is thought to have come from the surveyor who set off the boundaries of the land. The first post office at Colston was in the home of G. W. Beard and was later in the home of F. J. Kearse (mail is now delivered to this area from Bamberg or Ehrhardt). "Bamberg County - Celebrating South Carolina's Tricentennial, 1670-1970" published by Bamberg County in 1970. "The Colston Branch Baptist Church is the church located in the Colston Community. have ready sources of water to survive. My Aunt Minna Clyde O'Neal McMillan told me that she and her son "Hank" had found great numbers of Indian arrows near Indian Camp Branch." Captain Z. G. Graham sold 17 acres of land to the railroad for a turnout and station, and on December 25, 1830, the Charleston-Hamburg railroad made its first run through the area. The town of Graham's Turn Out was established in 1837 (recorded as simply "Grahams" by the state legislature). The first mayor was C. C. Cooper. "The railroad is at the center of the history of the town of Denmark. Originally established in 1837 as Graham's Turnout, the town became incorporated as Grahams in 1870. In 1890-91, with the crossing of two major railroad lines, the settlement shifted to this intersection. In 1891 the town was renamed for Capt. Isadore Denmark of Savannah, an official of the Seaboard who had shown some special interest in the development of the area. With the completion of a stretch of the Manchester and Augusta Railroad near the town, it became a railroad junction of some importance." (South Carolina Postcards, Vol. II). Sometime after the Civil War, the first school building was erected in Graham's Turn Out. In 1895, J. Arthur Wiggins became head of the school and was assisted by Miss Blanche Walker and Mrs. Julia Day. The last graduating class at Grahams, by then called "Old Town," or Sato, was the class of 1908. A brick school was constructed on North Palmetto Avenue in 1907 with E. H. Hall as superintendent. Built in 1893, the red brick hotel, called Rice's Hotel, and later Denmark Hotel, served on the west side of town, across from the depot. It served passengers arriving on the Seaboard line. Denmark's first store was built by J. E. Steadman in the same year. The first Baptist church of Denmark started in Bamberg in 1844 as the Cedar Springs Baptist Church, and relocated to Graham's Turnout in 1849, with the first in 1852. building completed The first sanctuary erected on the present property was built in 1904. The other older church congregations of Graham's Turn Out/ Denmark, and the dates of their establishment are: Ghent's Branch Baptist, 1834; Denmark First Baptist, 1844; Rome Baptist, 1867; Franklin Methodist, 1874; Denmark Presbyterian, 1894; and Bethel Park Methodist, 1907. Early physicians were Doctors Frederick, Tindal, Islar, Holman, Matthews, Wyman, Guess, Willis, Talbert, Boozer, Gillam, Varn, glennan, Lowman, Thomas, Mole, Daniel, Livingston, Moskow, and Wait. Voorhees Normal & Industrial School was begun in 1897 by Tuskegee graduate Elizabeth E. Wright. The brick 30-room Booker T. Washington Hospital, the gift of Ralph Voorhees of Clinton, NJ, was completed in 1904. An adjacent administration building was the gift of Mrs. Voorhees and was completed in 1916. The old hospital, recently renovated, now houses the offices of the college president. (South Carolina Postcards, Vol. II). The main street in town was paved in 1924 and street lights were installed. Jim Harrison's Art Gallery (Jim is a native of Denmark and has been painting "lowcountry" South Carolina and Coca Cola signs since 1952). I highly recommend a visit to his gallery if you're passing through Denmark! Ehrhardt was named for Conrad Ehrhardt of Weiterade Kuhrhessen, Germany, who by 1852, along with other Germans, had settled the area. He married Anna Doredea King in 1852 (both are buried in the Ehrhardt Cemetery), and they settled and built a farm and saw mill on Moccasin Branch. Other Germans joined the Ehrhardts. After the mill was destroyed by fire, the Ehrhardts moved to the present site of the town of Ehrhardt. Mr. Ehrhardt purchased a portion of the Martin Kinard land for $7,50 per acre in gold, and around 1860, he erected a saw and planing mill, grist and flour mill, and rice mill, with a general country store. Conrad Ehrhardt was a lover of music, and purchased the organ displayed at the Centennial Exposition in 1876. After building the Ehrhardt memorial Lutheran Church, he donated his organ to it. The post office was established in Ehrhardt in 1876, but the town was not incorporated until 1898, when a branch line of the Atlantic Coast Line Railroad was extended to it. In 1915, the local Bamberg, Ehrhardt, and Walterboro line, built largely with Bamberg capital and leased to the ACL to operate, opened rail communication between the two county towns. Many of the inhabitants of the Hunter's Chapel community are listed as residents of Branchville. "The Ayer family living on the borders of Sleytown were very wealthy. At the present time what was known as Sleytown is represented on its eastern side by the thrifty town of OLAR on the Seaboard Railway. Indeed, this town is the present business center of the Buford Bridge Community." According to Sybile McMillan Pierce, who had deep roots in this part of Bamberg County, Springtown was the site of an old Indian village, located approximately 5 miles from the Colston community. Below are Sybile's comments. "Nobody seems to know where the original site of the Springtown Baptist Church was located. The original church was built of logs. From what I have been told by the old ones, when they decided to built a new church, the original Springtown Baptist Church was bought by my great, great-grandfather Capt. Henry William McMillan and moved to the spot where Shady Rest Cemetery is located today. The second Springtown Baptist Church was bought by the McMillan family also. This church was given to the blacks of the community so they would have a church to worship in. I have seen this church many times, it was located on the same road that my Aunt & Uncle, Henry Vallentine & Minna Clyde O'Neal McMillan, of the Colston Community lived on. (This Church has been replaced with another Church) The third Springtown Baptist Church was burned and has been replaced with the fourth church."